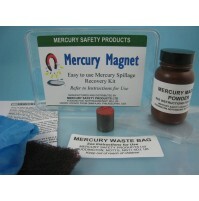 Mercury spillage kits are our core product range. Our kits have been on sale for 25 years and are used around the world in a huge range of sites including oil rigs, naval ships, schools, auction houses and of course medical and dental organisations. Replenishment pack for unused spillage kit What's this product for ? If you have a type HK Mercury Spillage Kit which has expired or is close to expiry (see date label on the back of the kit), and the kit has not been used, then you can extend its shelf life for a further 3-4 years by buying this REPLEN-UN pack. This is a lower cost option than replacing the entire spillage kit. Wha..
Replenishment pack for used spillage kit What's this product for ? If you have a type HK Mercury Spillage Kit which has expired or is close to expiry (see date label on the back of the kit), and the kit has been used, then you can extend its shelf life for a further 3-4 years by buying this REPLEN-USED pack. This is a lower cost option than replacing the entire spillage kit. What's in the.. Alloy Wool Adsorbent pack 10 Replacement pack of 10 Alloy Wool Adsorbent packets for replenishing HK type mercury spillage kits in large numbers, for example in the hospital or industrial setting. This patented method of lifting mercury spillages from fabric and soft surfaces is ideal for spillages on carpet and bedding. It works by forming an amalgam with the mercury, which dissolves ..
Brushes x10 Pack of 10 brushes for replenishment or replacement in larger numbers of hospital type mercury spillage kits, usually in the hospital or industry setting. The brushes are included as they allow quick and efficient mercury handling after a spillage. 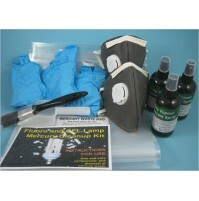 ..
Deluxe Home and Office Mercury Spillage Kit You can watch the instruction video on YouTube at https://youtu.be/iLDO-CmtlGs Why Why should I worry about mercury in my workplace office and home ? The most common source of mercury now is energy-saving light bulbs, also called compact fluorescent lamps (CFLs). These work in the same way as full size office-type fl..
Dust Masks x 10 These dust masks are used when mixing the absorbent powders in type HK mercury spillage kits. They provide protection against inhalation of calcium hydroxide and sulphur dust during mixing and use, but do not provide protection against mercury vapour, for which the mercury vapour mask is available on this site. The pack is for replensihment or replacement of masks in..
What's in the kit ? The kit contains everything you need to manage breakages of mercury containing lamps in larger facilities such as warehouses, lamp distributors and transporters. Each kit will deal with 3 breakage incidents. It contains: 2 mercury vapour-proof masks to protect the operatives dealing with the breakage 3 pairs of nitrile gloves 3 x 125ml spray bottles..
Home and Office Mercury Spillage Kit You can watch the instruction video on YouTube at https://youtu.be/iLDO-CmtlGs Why should I worry about mercury in my workplace office and home ? The most common source now is energy-saving light bulbs, also called compact fluorescent lamps (CFLs). These work in the same way as full size office-type fluorescent lamps; a small amount of mercury..
At last, an easy way to check if surfaces are contaminated with mercury. 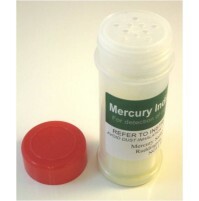 This highly specific mercury indicator powder reacts with mercury vapour to give a dark colour. Sprinkle it onto any surface and leave 24 hours, then compare the result with fresh powder. Full instructions and a guide to interpreting the results are supplied with the pack. A darkened appearance shows the ..
Wouldn't it be simple if mercury were magnetic, then you could easily pick up a spillage with a magnet ? Well now you can, with the Mercury Magnet Spill Kit, using unique technology licensed from our US partners Omni Ajax in Philadelphia. How does it work ? The special metal powder amalgamates with mercury in the spillage area, clumping it while making it magnetic through its iron content..
Mercury Safety Resource CD Intended for use in larger medical institutions and in the dental practice, the CD contains the following information: Instructions on how to use the standard mercury spillage kit Illustrated booklet showing full use instructions, with photos specifically for the dental team: PDF version of the book 'Mercury Hazards in Dentistry' PDF version of th..
"EVERYTHING YOU COULD POSSIBLY NEED, ALL IN ONE PLACE" Our flagship product; the Mercury Safety Station. Designed in response to our customers' needs for a single-location comprehensive mercury hazard management product which covers all of the event scenarios likely to occur in premises where mercury is used or is a known contaminant. 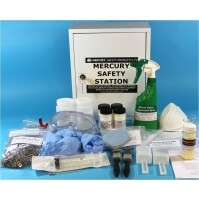 The Mercury Safety Station replaces standard mer..